Italian cuisine wasnt that much familiar to me until i lived in India, we hardly get the macaroni and mom usually cook as a spicy dish with it, apart from that i never tasted this famous cuisine. But once i came to Paris, my MIL prepared the famous spaghetti pasta with bolognase sauce the next day itself, i thought that spaghetti pasta is noodles, than later came to know that its an another variety of pasta. Now twice or thrice a week,i have to prepare pastas coz my kids just love this food and its quite like a staple food for us. 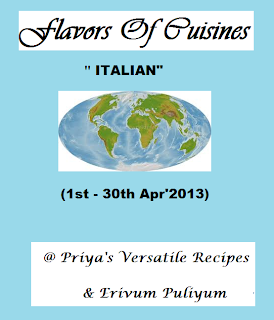 This month am hosting a new event started by Julie of Erivum Puliyum called flavors of cuisines, when she announced the event i didnt hesitate a second to ask for hosting this event and she immediately accepted my interest for hosting. So this month's flours of cuisine is going to be Italian foods.Anything from Italian cuisine is welcome and you can make any course of food from this famous cuisine. 1.The event runs for the period 1st April to 30th April. 2.The theme for each month is "Italian ".It can vary from starter,main dish ,side dish,soup,dessert or any other recipes,sweet or savory anything but strictly from that particular cuisine with the same ingredients & spices.No modifications or fusions or alterations is accepted. 4.Recipe must be linked to thi announcement page and to Julie's announcement page. 6.Send in any number of entries.You can link in two old or archived posts.No need to repost the post just add the link & logo. 7.Usage of logo is appreciated for all entries as it would help spread the word. Nothing will beat the aroma of freshly baked breads at home na, finally after many cakes and wonderful challenges, our this month's Baking Eggless, a baking event started by Gayathri, landed on dinner rolls. Priya Srinivasan suggested this amazing dinner rolls from Cooking Classy and am sure the home bakers like me who are all part of this baking event will definitely come out with different egg subsitutes and mine is silken tofu. Have you ever tried breads with tofu, if not you guys have to give a try. Tofu gives a wonderful texture and make breads very soft,spongy and definitely you need less butter or oil. Am happy that i prepared my dinner rolls with this incredible soya cheese. I tried my hands in baking breads with rye flour few weeks back for a baking event, obviously i loved the addition of this healthy flour instead of wheat flour in my breads. Then i prepared many bakes with this super healthy flour. 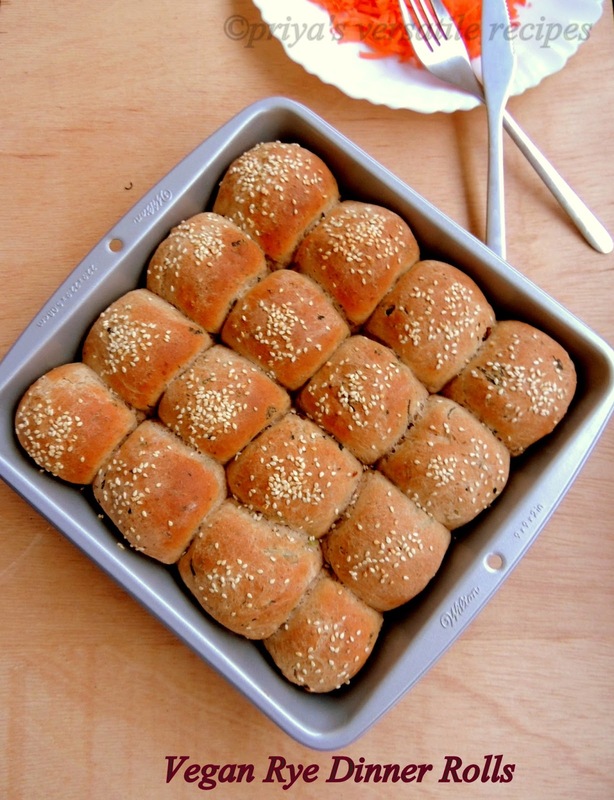 My today's post for baking eggles event is a vegan dinner rolls with rye flour, silken tofu, olive oil with some red chillies flakes and herbs, yep this dinner rolls is not the sweet one. I prepared this dinner rolls few days back for our dinner and served it with some grilled meats and carrot salad. Tofu in this dinner rolls turned it out extremely soft and herbs and chilly flakes gives a wonderful flavour.If you dont have rye flour you can skip it and use very well wheat flour, mix and match the ingredients according to your tastebuds.This dinner rolls stayed prefect even after two days in room temperature. Take the both flours, dry red chilly flakes, dry herbs in a bowl, mix everything well. Slowly add the foamy yeast,pureed tofu and olive oil and knead as a soft dough. Let them sit for an hour until they double the volume..
After an hour, punch down the doubled dough and knead again..
Make 16 small sized balls from the dough and arrange one by one in a greased mould and let them sit again for an hour in a warm place..
Brush the breads with olive oil,sprinkle the sesame seeds on the top and bake in middle rack for 20-25 minutes until a golden brown crust forms over the bread. Serve with salads,soups or with any spreads. Easter is around the corner and everyone here are getting ready for the easter celebrations. Its a long weekend for us and am sure its going be bit busy for me as always,if kids are at home.As most of my followers know,i love to be a part of baking events, so that i can learn more about the baking especially when its comes with breads with yeasts. 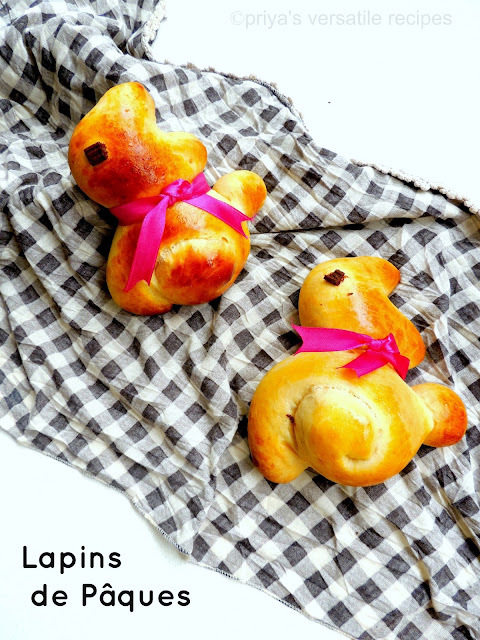 Thank god till now yeast beast will always behave kind with me, coming to this Easter bunnies bread,our this month's Defi Boulange, a fabulous bread baking event by Nadia and Manue challenged us with damn cute and attractive Easter special bunny shaped breads. I baked some bunnies during last weekend, these bunnies turned out extremely spongy,soft and mildly flavorful coz of the addition of vanilla extract. It was a big hit among my kids,they enjoyed thoroughly with their favourite chocolate drink and i enjoyed with my usual masala chai. An excellent snack,quite filling and the bread dough was super soft as like brioche with mild sweet. Thanks to both Nadia and Manue for pulling me to make this adorable bunnies at home. Meanwhile take the flour,egg,sugar in a large bowl, add gradually the foamy yeast and turn everything as a soft dough, now add the butter and knead everything for 10minutes. Arrange the dough in a bowl covered with a towel,keep aside for atleast for 2hours until they double. 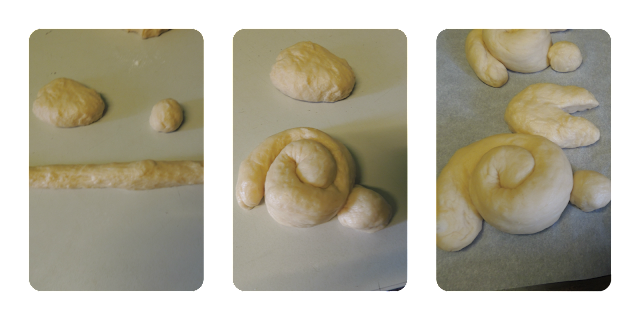 Knead the dough well and divide it as 6 large balls. Divide each balls as small ball,large ball and a medium ball. Roll the large ball as a rope, while the medium ball as oval shaped ball and small ball as round ball. 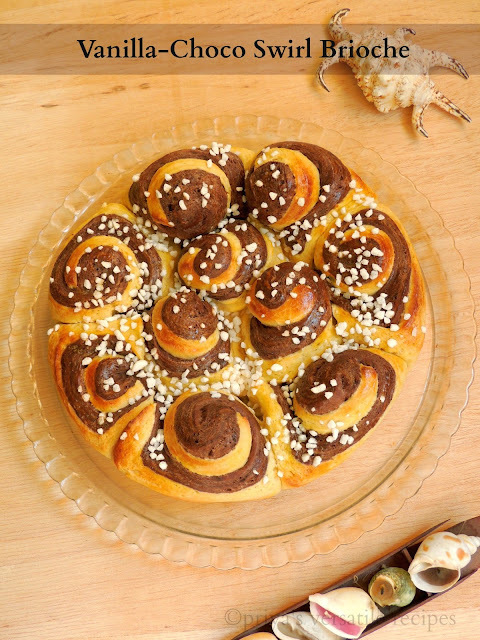 Roll the long rope like dough as shown in the picture, cut the oval shape ball in the middle to half of the ball and separate it to make bunny's ears. Keep the small ball as shown in picture to make the bunny's tail.Arrange the rolled bunnies over a baking tray. Keep the baking tray in a warm place for half an hour. Preheat the oven to 350F for 5minutes. Mix the egg yolk with milk for brushing together. Place a chocolate chip on the head of the bunny to make an eye. Now brush the unbaked bunnies generously. Bake them for 20-25minutes until the crust turns golden brown. Cool it completely on a wire rack and enjoy. Guest posting, love the bond behind this. Actually its been a while i havent written any guest post and am here again with an another interesting guest post i created myself to one of my new blogger buddy. Blogging is a virtual world and we cross a daily a number of virtual friends, but some have their important place in our life. Even its a virtual world, some of my blogger buddies proved that this virtual friendship may create a wonderful bond beyond blogging. Saranya of Sarani's Kitchen, is one among those buddies aka my sister who is a wonderful person,very calm and charming gal i met personally in my life. Before few months, we dont know each other. The bridge between us is Priya of Cook Like Priya, she introduced me Saranya and met her during my weekend trip to London. We spend together a whole day at Blogger's Buzz Meet and am very happy to met her and had loads of fun with them.Saranya's blog is a beautiful place where she shares our traditional foods,beautiful bakes and many more interesting foods. Trust me,she is a wonderful baker too, you will be surprised to see her anniversary cake she baked for her marriage anniversary.It was a mindblowing black forest cake and she simply rocked. Am proud to do this guest post for a down to earth and affectionate blogger. 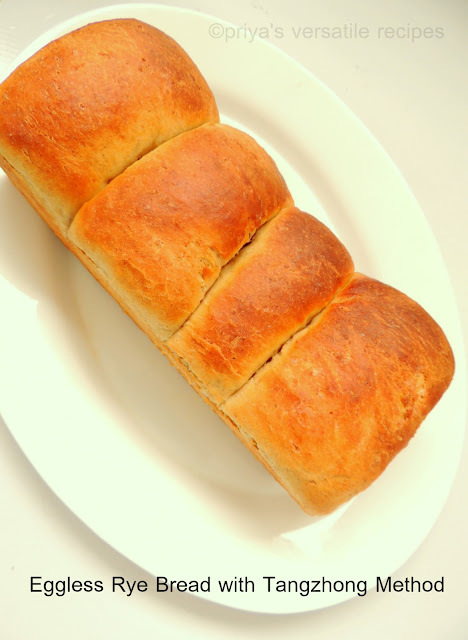 I know when saranya asked me a guest post, i really want to make her a beautiful bread, brioche is one of our family favourite bread, before i'll get them often from stores. Now i competely avoiding and bake myself, so that i can mix and match the shape and flavour of the brioche as my mind goes for. 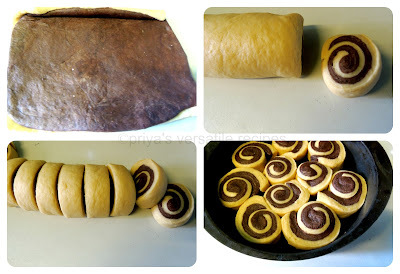 This is how i prepared this double colour swirl brioche with vanilla flavoured dough and chocolate flavoured dough.Hope you all will enjoy this amazing and very attractive bread. Meanwhile take the flour,egg yolks,sugar in a large bowl, add gradually the foamy yeast,vanilla extract and turn everything as a soft dough, now add the butter and knead everything for 10minutes. Divide the dough as a two equal balls. Take a ball, add the cocao powder and knead well until the cocao powder gets well mixed. Arrange the doughs in a two bowls covered with a towel,keep aside for atleast for 2hours until they double their volume. Knead the dough again for few minutes. Roll the balls are two rectangles, place the cocao dough over the vanilla dough. Roll them tightly as a log, slice the logs are 10-11medium slices and arrange them in the greased round pan. Keep the moulds in warm place for half an hour. Mix the egg yolk with milk for brushing together, now brush the uncooked brioche generously,springle the sugar pearls on the top of the brioche. Bake them for 25-30minutes until the crust turns golden brown. Have you ever tried a stir fry with raw banana peels? 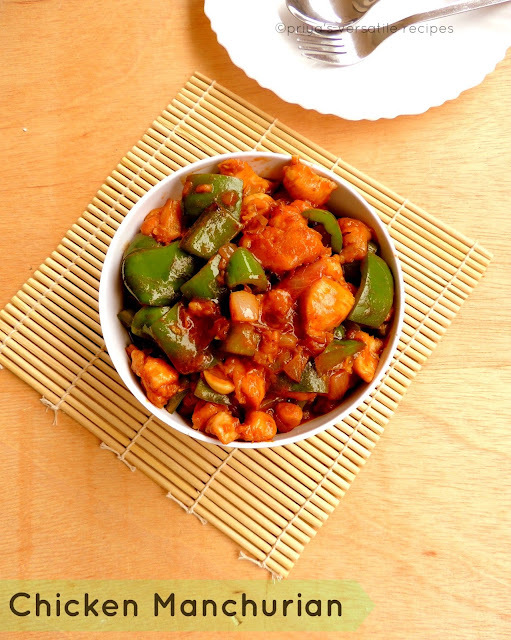 you guys have to give a try to this wonderful stir fry. You wont ever trash these peels anymore if you try your hands in making this stir fry. 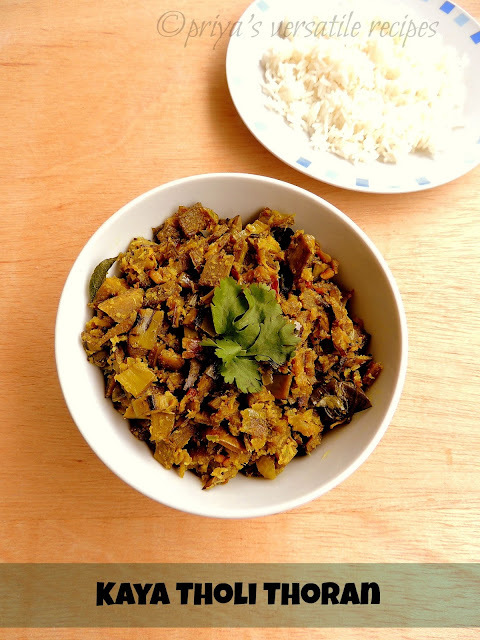 Once you peel the skins of the raw banana aka green plantains, just chop them and cook in water until these peels get cooked.With usual spices, temper this stir fry and cook along with a coconut,green chilly,garlic cloves and cumin seed paste, your kaya tholi thoran is ready. I crossed this thoran long back in this blogworld,but somehow i couldnt able to prepare them earlier. Last week, i got super fresh raw bananas from Indian store,after making chips with the raw bananas,instead of trashing their peels, i simply prepared this peels as this thoran. I served this thoran with hot piping rasam and everyone at home enjoyed thoroughly.Until i revealed the secret, none at home noticed that this thoran is prepared with raw banana peels.Sending to my own event Healthy Diet-Go green guest hosted by Amurta. Meanwhile cook the chopped raw banana peels in water with turmeric powder and salt until they get cooked. drain the water. Heat the oil, let splutters the mustard seeds,urad dal and curry leaves, now add the cooked raw banana peels, grounded paste and salt(if needed) and cook until the raw bananas get well coated with grounded paste. You may surprised to see the name soft pakodas, yep we make two types of pakodas one is extremely crispy pakodas and the another one is soft pakodas. Soft pakodas aka medhu pakodas will have baking soda in their pakoda batter while we add more rice flour but not baking soda in crispy pakoda's batter, apart from it you can add any veggies or greens in these both pakodas. Inspired by my mom's medhu pakodas,I tried my hands in making this medhu pakodas few days back, she usually prepare her pakodas just with onions and coriander leaves, but i prepared mine with finely chopped Amaranth leaves. Seriously kids wont mind having deep fried fritters with watever they are prepared.Obviously if my kids hate any veggies or greens, i'll try to feed them either by adding in pakoras or in vadas. 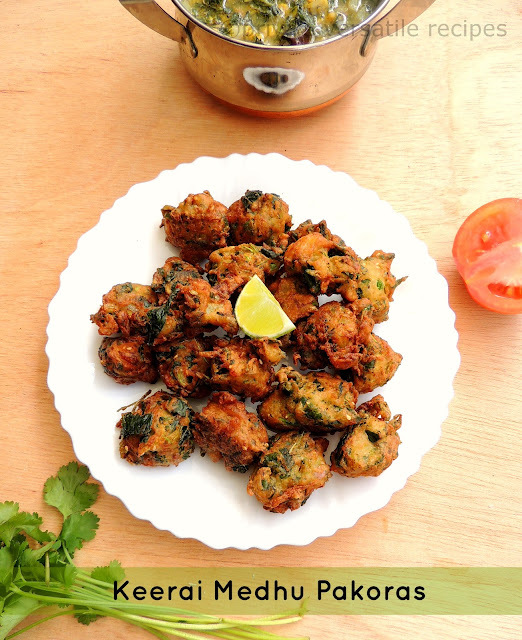 Coming to this pakoras, these green pakoras is my last post for this week's blogging marathon, pakoras are my favourite street foods, as a kid i always loved to munch these crispy beauties. Needless to say, these pakoras are my kids favourite too, since i chosed Kid's delight-street foods as this week's theme of blogging marathon am posting this crispy pakodas today.Check out the Blogging Marathon page for the other Blogging Marathoners doing BM#26.Sending to my own event Healthy Diet-Go green guest hosted by Amurta. Take the finely chopped amaranth leaves,chopped onions, cornflour, gram flour,baking soda, rice flour,grated ginger, chopped green chillies, fennel seeds,curry leaves and chopped coriander leaves with enough salt. Mix everything well,springle some water and turn everything as a thick paste. Make small balls from the thick paste, drop gently to the hot oil, fry until they turns crispy and golden brown. 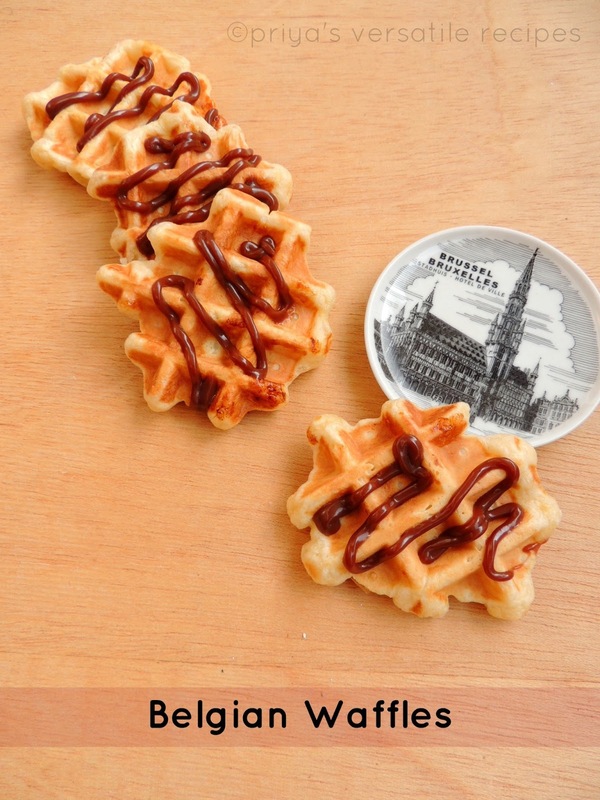 Belgian waffles are quite famous for their lighter batter than tha standard American waffles. Belgian waffles have number of different varieties ,one among those variety is Brussels waffles. Brussels waffles will be bit hard and crispy outtside. Traditionally American waffles are prepared with baking powder,while Belgian waffles goes for yeast. This makes a huge difference in the texture of the waffles. As you all know that am running my last week of blogging marathon from yesterday am here with an interesting true Belgian waffles as my theme for this week is Kid's delight- streed foods. If i go out with kids, they will definitely ask either French crepes or Belgian waffles,they love this street food very much with loads of nutella. Obviously these two street foods have their important place in my kid's favourite street foods. I prepared these waffles this weekend at home itself, my kids enjoyed thoroughly with their favourite spread. This waffles goes for eggs, yeast and all purpose flour, usually waffles have butter in it, i skipped the butter and i replaced it with oil.Check out the Blogging Marathon page for the other Blogging Marathoners doing BM#26. In a bowl, take the all purpose flour,sugar,yeast,salt, meanwhile beat the egg yolks lightly..
Gradually add the milk,vanilla extract,oil,beaten eggs to the dry ingredients and stir well with a wooden spoon. Beat the egg while until stiff peaks form, fold gently into the batter. The batter should be bit thick but shouldnt be thin. Keep in a warm place for 30minutes or until you can the batter starts bubbling. Preheat the waffle maker, drop gently this sticky batter and bake. Serve with your favourite syrup,jam or chocolate sauce and nutella with some fruits. Am starting again today the 4th week of blogging marathon, this week's theme is going to be kid's delight - Street foods. Who will say no to street foods, especially kids. What is street food? street food is ready to eat food or drink sold in street or in any other public place. Mostly street foods are finger foods and fast food,obviously street foods are cheaper when compared to the foods served in restaurant.You can see a decent bunch of street food stalls everywhere now and we cant keep ourselves away from this foods. For my first day of this week's blogging marathon, am posting this masala sweet potato chips. Usually i love to munch these crispy munchies and i'll literally beg my mom to get a packet of chips whenever we go out. I know even now, i wont forget to grab a packet of chips whenever we plan to go for a picnic, chips have their important place in our weekend plan too. This sweet potato chips is one among the chips, my kids just love them to munch them. Whenever i make this chips, needless to say how fast these crispies will get vanished. Usually i'll go for a chilly powder and salt for spicing this chips,but when i crossed this masala chips at Rumana's space,i really want to give a try and i spiced my chips with chaat masala.You guys have to make these masala chips to know how tasty they are.Check out the Blogging Marathon page for the other Blogging Marathoners doing BM#26.Sending to Srivalli'ss Kid's Delight-Street Foods guest hosted by Preeti. Wash the sliced sweet potatoes and spread them for few minutes over a kitchen towel. Heat enough oil, drop gently the slices one by one and fry until they turns crispy. 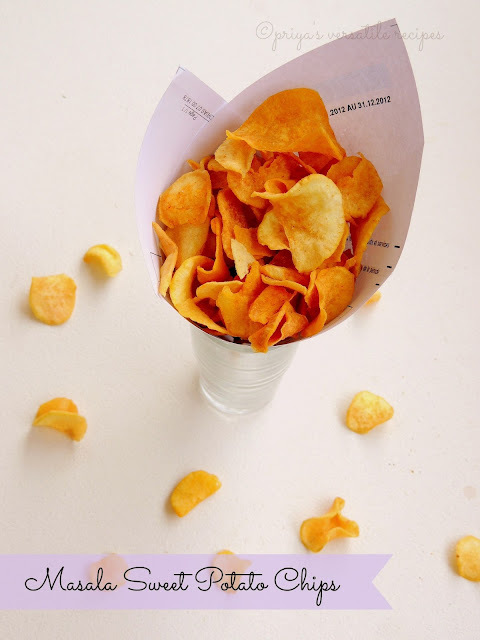 Remove the chips from oil, drain the excess of oil with a paper towel. Springle immediately the red chilly powder ,chaat masala and salt, give a quick toss and continue frying the remaining uncooked chips..
Conserve in a air tightened box. 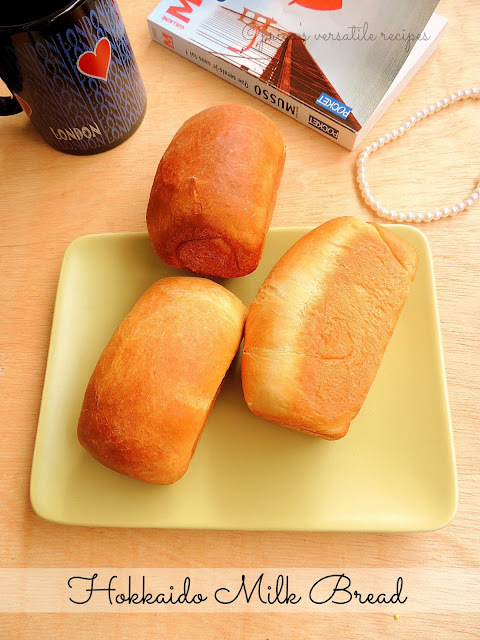 Hokkaido milk bread, super spongy bread prepared with the famous Asian bread making method called tangzhong method. Tangzhong method goes for a water roux, this roux is the prominent ingredient to get fantastic soft breads. For our this month's We knead to bake, a month baking event started by Aparna of My Diverse Kitchen, she challenged us to make this Hokkaido Milk Bread which is well known for their super softy texture. Its quite popular in South Asian bakieries, some people says this is a Japanese bread, because of the milk used in this bread comes from Japan.While others says that its pure white colour and the texture resemble the pristineness of Hakkoido. Coming to Tangzhong method, this method need a part of bread flour with 5parts of water,when cooked its forms the famous water roux. The gluten in the bread flour and water mixture absorb the moisture and create a leavening action. 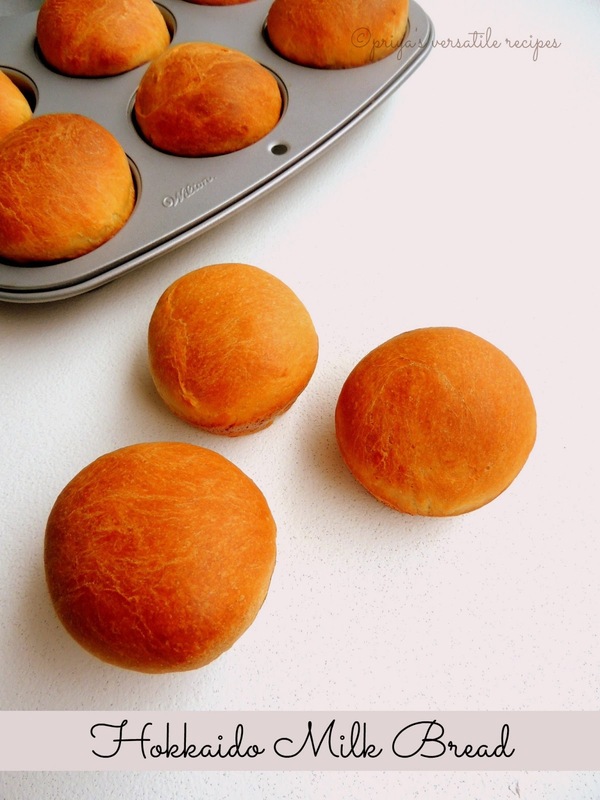 When Tangzhong is added to other ingredients of the bread dough, its gives a light,tender and fluffy bread.The dough prepared with tangzhong is a versatile dough, we can make palin loaf,dinner rolls or muffin like rolls. 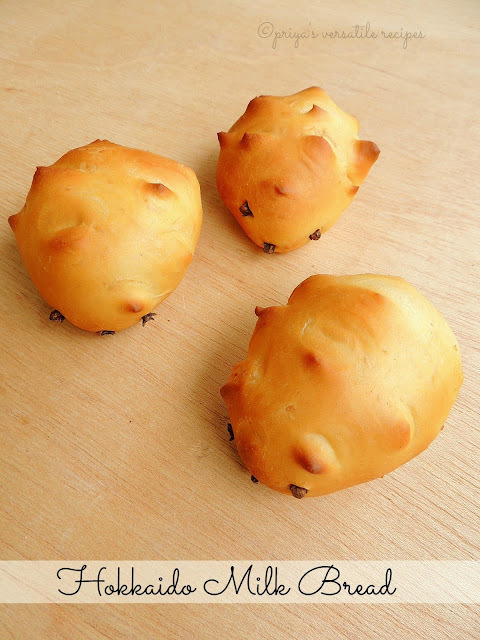 You can fill very well them with sweet or savoury filling.I prepared few mini loaves, some muffins rolls and tried my hands in making some animals. I filled my mini loaves and muffin rolls with chocolate chips and my kids just loved them. Mix the flour in water and milk well without any lumps. Cook in medium low heat, stirring continously with a whisk to prevent buring.This mixture will becomes thickens, if you are able to see some lines for every stir you make with the spoon,your tangzhong is ready,remove it from the heat. Transfer it to a clean bowl,cover with a cling wrap sticking on the surface of the tangzhong to prefect from drying. Let cool completely.You can use tangzhong straight away once it cools down to room temperature. Put the flour,salt,sugar,milk powder and instant yeast in a stand mixer or in a food processor and mix it for a few minutes,meanwhile in an another bowl,mix the milk,cream and tangzhong until smooth and add to the mixer. Run in slow speed until the dough comes together, now add the butter and knead it until you get a smooth and elastic dough. Arrange the dough in a greased bowl and cover it with a towel and keep it aside until the dough double in volume. Mine took almost an hour. Place the dough in a cleaned working surface, divide the dough to make mini loaves or muffins or else as single loaf. Roll out each portion of the dough with a rolling pin as a oval shape, sprinkle generously the chocolate chips. Take one end of the dough from the shorter side of the oval to fold in the middle of the dough, take the other end and fold it slightly to overlaps the other fold. Arrange this folded dough to tha prepared pans and cover with a towel,let the dough sit again for an hour. Preheat the oven to 325F, carefully brush the tops of the rolls and the loaf with milk and bake them for 20-25minutes until they are done. Let them cool completely in the tins and then unmould, transfer to a rack and cool them completely. Serve the loaves or dinner rolls with your favourite spreads. Rasam, my readers will definitely know my love for Indian style clear soup aka rasam. At mom's place, she used to prepare rasam daily for our lunch and she usually grind her homemade rasam powder in huge quantity. But at Mil's place, rasam dont have its place in daily cooking,obviously my husband dont give much preference to this Indian soup. Needless to say how i struggled before to feed him with my favourite rasam, thank god my H quickly started loving rasam and i can proudly says that we are rasam family now. 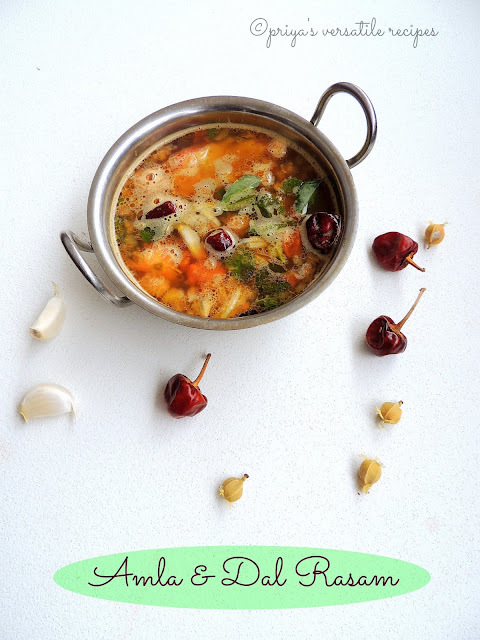 Today's post is with Indian gooseberry dal rasam, gooseberries have many health values and we get abundantly in India, but unfortunately if you live in abroad you will definitely miss this healthy berries.We get rarely this berries here, sometimes i dont even pick them as they wont be that much fresh. This time when i went to Indian stores,i couldnt keep myself away after seeing some super fresh gooseberries, back home i prepared two beautiful dishes with it and one is this Indian style soup. If you get gooseberries,dont forget to make this fantastic rasam.Sending to my event CWS-Dals and Healthy Diet-Go green guest hosted by Amurta. Remove the seeds from the cooked gooseberries and grind a thick puree. Now take this puree,crushed tomato,cooked toordal,curry leaves, crushed garlic cloves, coriander leaves,salt and rasam powder in a bowl. Add enough water to make it thin. Heat the ghee, add the cinnamon stick,cloves and dry red chillies, fry until they turns brown. Add immediately the already prepared gooseberry-dal mixture to the tempered spices, once the rasam starts bubbling put off the stove. Add the lemon juice and give a stir, serve with rice. Amaranth leaves are quite often used in South Indian cuisine, when the leaves are cooked along with dals or as simply as stir fry or else as mashed curry, we wont trash out their stalks aka stems.Once we remove the leaves from the stalks or stems, immediately we will broke the stalks as small pieces and use them in making dals,gravies or else as stir fries. So obviously if you get amaranth greens, you will get use of this greens completely and you will just trash their roots in case if you buy with their roots. Last week, i picked a super fresh amaranth green from Indian stores, back home i prepared a simple stir fry with their leaves and used their stalks for making this delicious sambhar. 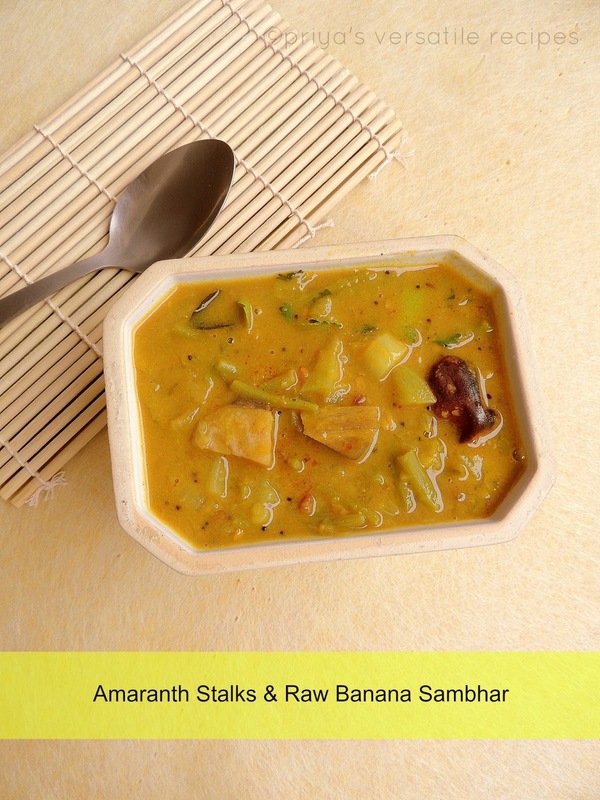 Since i had some raw banana aka plantain, i just included them to this aromatic sambhar. This dal goes awesome with rice,rotis and even much more prefect with South Indian breakfast foods like Idlis and dosas.Sending to my event CWS- Dals and Healthy Diet-Go green guest hosted by Amurta. Heat enough oil in a pressure cooker, let splutters the mustard seeds, urad dal, fry the fenugreek seeds,cumin seeds and dry red chillies. Add now the chopped onions,curry leaves,cook for few minutes until the veggies get cooked. Now add the raw banana cubes cook for few minutes. Add the tender amaranth stalkes with enough grounded spice powder,turmeric powder along with salt,cook everything in simmer for few minutes..
Chicken manchurian, while going through my recipe index few days back, i noticed that i havent posted yet our family favourite Indo chinese dish manchurian with chicken.This manchurian tastes absolutely delicious,yummy and a tasty side dish to enjoy thoroughly with a bowl of fried rice.If you are bored of usual stir fries or gravies prepared with chicken, this yummy manchurian will definitely satisfy your tastebuds.Sending to Julie's Flavors of Cuisine-Chinese. Heat oil in a pan.Dip the cubed chicken in the batter,drop gently to the hot oil and fry in oil. Drain the excess of oil and keep aside. The mixture will start to thicken, keep on stirring on low heat and when the mixture turns semi thick add the tomato ketchup and then add fried chickens. 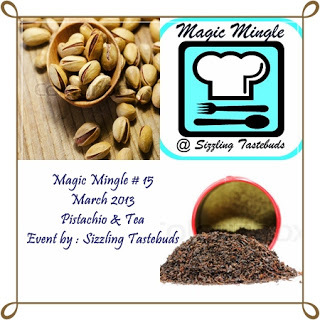 Stir continuously for a couple of minute when it becomes soft, take it out from fire. If i forget to grind usual idly batter,obviously my mind will go for non fermentation dosa batters. Moongdal batter works out wonder and i do prepare quite often this batter at home. Sometimes i mix and match the ingredients,needless to say my space have a variety of this kind of non fermentation dosas. This time i tried my hands by mixing both sweet corn kernels and green whole moongdal, trust me this combo rocks and the picture will speak definitely a lot. Serve this nutritious dosas with your favourite side dishes,definitely your dinner or breakfast will satisfy your tastebuds. 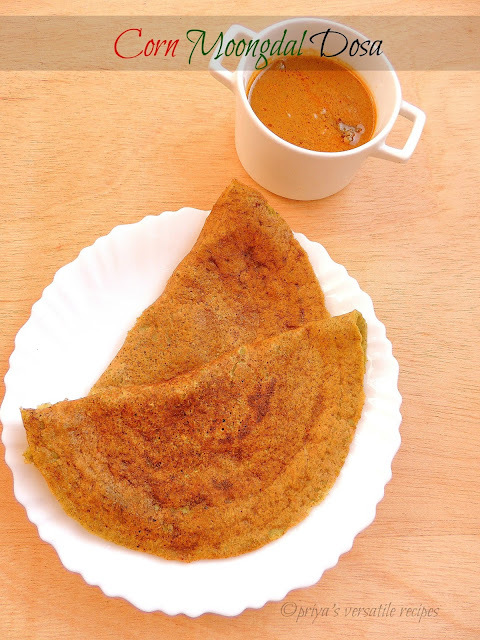 If you want to add more dals like channadal,toor dal dont hesitate a second, soak them along with whole green moongdal and make this dosa batter.Nutritious and protein packed dosas,just enjoy with a spicy chutney, am sure everyone at home will love it.Sending to my event CWS- Dals. Mince the ginger and chop the green chillies. Grind the soaked whole green grams along with sweet corn kernels, chopped green chillies, minced ginger, chopped coriander leaves and cumin seeds as smooth paste with enough salt..
Heat a tawa, pour a ladle full of batter, and turn the batter as dosa. Springle the chopped onion chunks over the batter, cook on both sides until the pesarattu turns brown. As i promised am here again with a beautiful second guest post from a wonderful blogger. She is none other than Divya Prakash who blogs at Divya's Culinary Journey, i have so many sweet memories to share about Divya. She is one among the fabulous,humble, affectionate,caring,down to earth,jovial sisters i have met through this virtual world. With two lil darlings, she is a busy mom eventhough when i asked her a guest post for me she said immediately 'yes'. Actually we are just fellow bloggers before few months, but the bond between us took an another direction and we are getting very closer now. Her blog is a wonderful space where she shares many Indian style foods, healthy bakes and many more healthy foods with wholegrains.Everytime,while bloghopping she never failed to surprise me, she always come up with eye catchy clicks. She have a magical hands and her clicks speaks a lot. 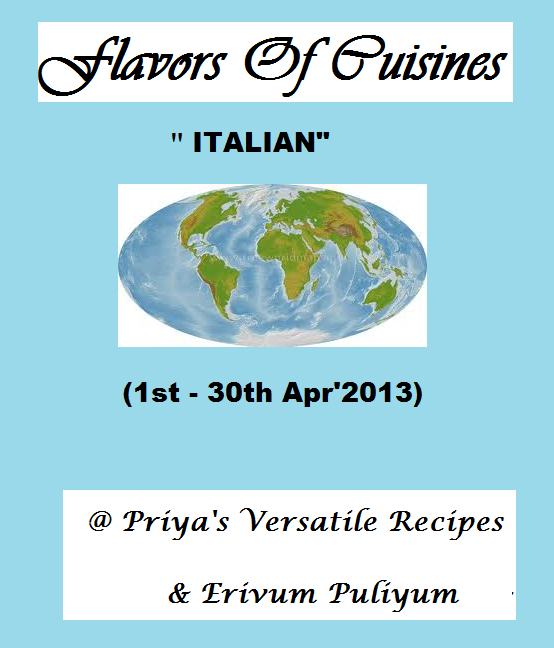 Shall we go to meet my second guest Divya Prakash of Divya's Culinary Journey.. When Priya Akka came up with the idea of Rendevous with a Foodie, I immediately wanted to be a part of it. Little did I then know, that will lead to some wonderful friendships which I will cherish throughout my life time. We have bonded so much that our group chat, is full of laughter and fun, it is like the good old college times. Thanks to Priya Akka for all these. She is one of the most wonderful person I have come across and a versatile blogger whom I look up with much respect. She has been blogging for five years and have been posting almost every single day. She has approximately 2390 recipes in her space. So it was challenge for me to decide on what I want to make for her that is special and has not been already blogged by her. I wanted to make something sweet and something baked. 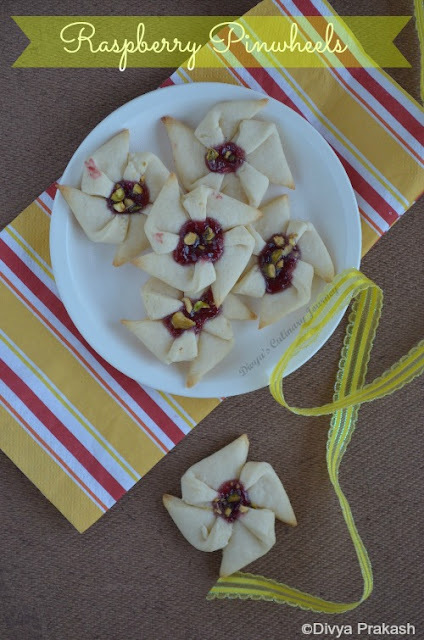 Finally zeroed on this Raspberry pinwheels and it came out really wonderful. My kids just loved it. My name is Divya. I am from Coimbatore and now in USA for the past 3.5 years. I am a stay at home Mom of two kids. My family loves to eat good food and I love to cook for them. My blog shows my passion for cooking and baking. It has tried and tested recipes from my kitchen. Before blogging I would not experiment much, even if I am trying something new, will stick strictly to the recipe and have not tried any other cuisine except Indian. After I started blogging , I have started experimenting, trying various cuisines. Being away from home, I used to feel lonely at times. After I started blogging I have got a lot of good friends who are always there when I need them. Priya Akka is one among them. Before, I was not very interested in Photography. But blogging has changed that. I have developed interest in Photography and I am constantly trying to improve my pictures. Before I started blogging, I used to click pictures and share in Facebook. I started my blog on January 31, 2012. Though I created my blogger account much before that, that day I just created a blog, clicked and posted my first recipe. 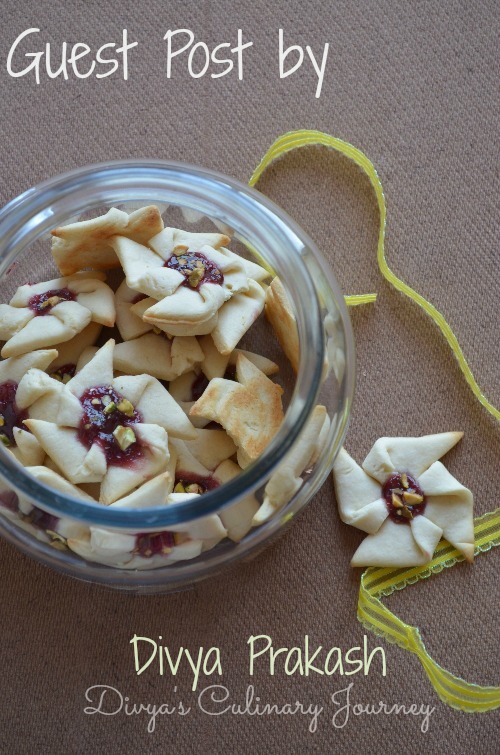 I thought with blog, I can share both pictures and recipe to my friends and family. I knew very little about blog then. My Mom and Dad were and are very supportive. My husband is my first critic. He gives his honest opinion all the time, also when he is free, he proof reads for me and helps me with the clicks. My brother is the one who designed the blog header for me. Though he is a Pilot, he is very good with Photoshop and he is very creative. And you all know about the kids and the help they do for the blog. I like to cook very simple and easy recipes. I mostly stay away from complicated process. My blog contains simple and easy recipes for a novice cook/ baker. My Mom is my inspiration. My Mom is a working woman, still there are times she has cooked each one of us different dish the same time. She has never complained about it. There are some recipes which taste good only when Mom cooks. We call ‘Kaipakkuvam’ in Tamil. It has been 2 years since I had mom’s food.. Waiting to enjoy her love, pampering and cooking. Every day there will be new challenges. With every challenge I learn something new. In that, One is Social Media. Except Facebook I was not familiar with other social Medias like pinterest, twitter or stumble upon. But now I have account in all three, but except Stumble Upon, I am familiar with other two. Also other issues like HTML codes, other technical stuffs, when I have such issues, my Hubby will provide the support. These are the convenience of having a husband who is a software person. I like my Oven roasted Broccoli and the other recipes which I like are Strawberry Jello Pie, Corn Fritter, Chocolate Cake and Blueberry Icecream etc. 8) Few tips about food photography? I am still a novice photographer..I am still learning every day. Composition of the picture is important. Do a little styling to the food before clicking. I don’t spend much for the props. I usually use what I use normally at home. But recently I started buying few props, but I still haven’t used them in any. Surprisingly they are not more than 2-3 $ each. 10) How do you plan your blog post? Do you post rarely,regularly or once a week? I usually post 3 posts a week. But with change in schedule or if something comes up, there may be a change in this schedule. 11) Do you have any other passion apart from food blogging or blog you own? Apart from blogging, I like to paint and also I like to sew. But with an energetic toddler at home, I hardly get time for this. Mix cream cheese and butter together until they are well blended. Then beat the eggs and add to the mixture, mix well and add vanilla extract and mix well. To this add flour little by little and mix well. Divide the dough into two, cover it with plastic wrap and refrigerate for 3 hours. 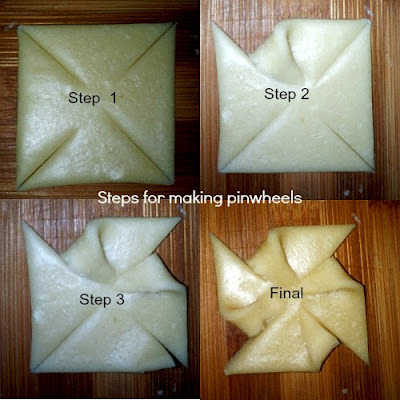 Then roll the dough into the required thickness and using knife, cut the dough in squares of required size. Then take each square and shape it in to a pinwheel. Then drop a required amount of jam in the centre of the pinwheel and top it with chopped nuts. In a cookie tray, line it with parchment paper. Arrange the prepared cookies in the tray. Pre heat the oven to 350F and bake the cookies for 8-10 minutes. Let the cookies cool in cooling rack, then transfer to airtight containers and Enjoy. It yielded around 48 cookies for me. The number of cookies depends on the size of cookies you make. I made 2 inches square. You can use any seedless jam of your preference. 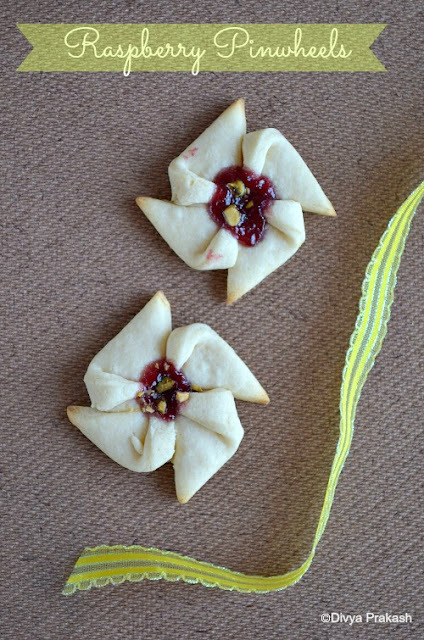 If you use strawberry jam, call them strawberry pinwheels. The timings of the cookies in the oven vary with each oven. Mine got done in 8 minutes. So keep an eye in the oven. Hope you all enjoyed this guest post by Divya Prakash, dont forget to check who is my next guest on 7th of April with an another bubbly blogger buddy. Been born as a South Indian,my love for chinese foods pulled me to make some wontons at home itself with store bought wonton wrappers i picked from my favourite chinese store.Usually we buy already prepared prawn wontons from the frozen section, but last time when i picked a packet of those famous frozen wontons, for my surprise some wontons are prepared with pork, i immediately left the packet there itself. Now am keeping myself away from those frozen ones. 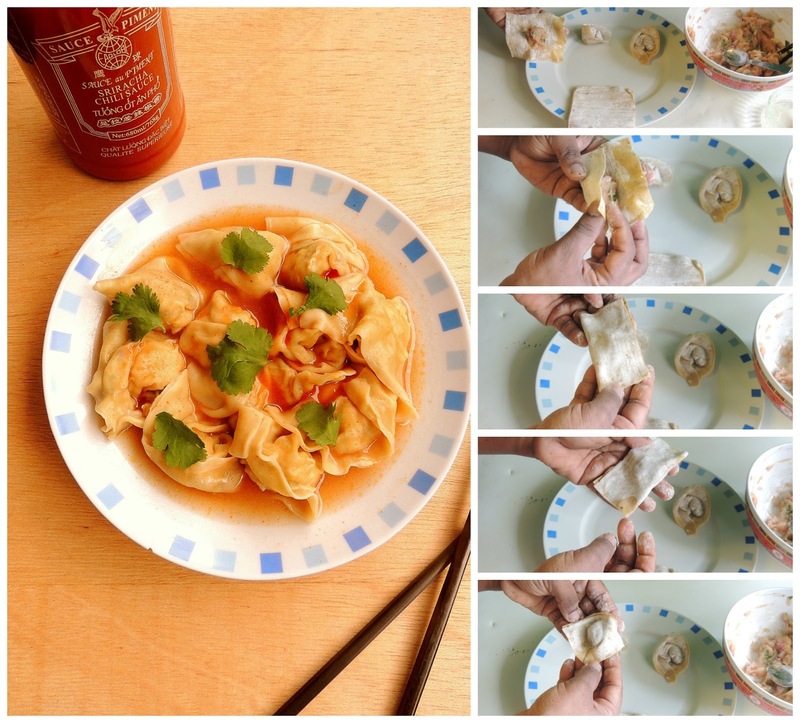 Everyone at home started asking for some wontons, finally i decided to make myself at home.I checked few of the chinese sites to get a better idea of making wontons at home and i found that they are very easy when compared to our Indian samosas. It took less than half an hour for me to make almost 30 numbers of wontons.Needless to say how fast they gets vanished, we just loved it and got some beautiful appreciation from everyone at home, especially from my lil one he told me never to buy those frozen wontons and gave me a big hug as he loved very much these homemade chicken wontons, watelse a mom need na.Sending to Julie's Flavors of Cuisine-Chinese. Take the minced chicken meat with grated ginger,chopped spring onions,soya sauce,salt, white pepper,egg white,corn starch in a bowl and mix it in one direction until everything gets well mixed. 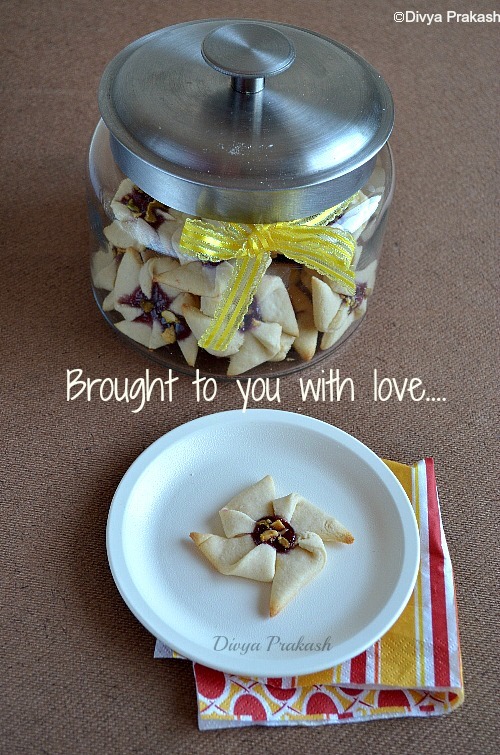 In a pot,bring boil enough water,once the water starts boiling,put 10numbers of wontons and stir gently. Once the wontons start coming to the surface of the water,they are cooked. Remove it from the water and put in a bowl. Meanwhile mix all the ingredients given under the list for sauce, add enough sauce to the cooked wontons and serve immediately. 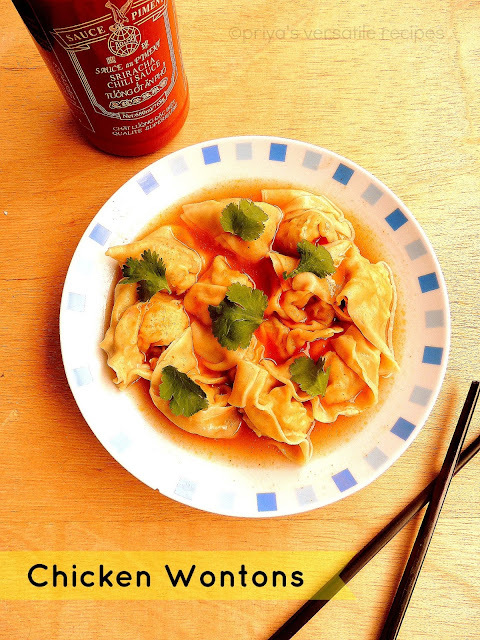 Enjoy these wontons, a prefect appetizier. My two previous posts are with coconut as main ingredient, you guys might have noticed that. As my theme for this week's blogging marathon is 'chose an ingredient and cook from 3 different cookbooks' i chosed coconut as main ingredient. For my today's post, am here with a very addictive coconut laddoos from Bengali cuisine, i chosed these cute laddoos from Malini Basu's Miss Masala cookbook.Traditionally this laddoos are prepared with jaggery and whole milk. Thank god i recently picked a packet of jaggery from Indian grocery, thats why i chosed to prepare this coconut laddoos for my third day of blogging marathon. This coconut laddoos gets ready really very quick, quite an easy breezy sweet. Malini used dark muscovado sugar and condensed milk, but i prepared mine with jaggery and unsweetened condensed milk. Unsweetened condensed milk aka evaporated milk and jaggery together works prefectly, this laddoos are one of the very easy sweet i have tried till now.If you need something quick as a sweet for a pooja or to serve your sudden guest, you must definitely give a try to this fabulous cuties.Check out the Blogging Marathon page for the other Blogging Marathoners doing BM#26.Sending to 27 coupons & Swathi's Traditional Indian Sweets. Take the coconut,milk and jaggery in a heavy bottomed vessel,cook everything in medium flame for 10minutes and cook in simmer until they liquid evaporates and you get a sticky,thick mixture. Form little balls out of the slightly warm mixture with ur hand. Place on a plate and chill it in fridge for a atleast two hours. Beware these laddoos are quite addictive. My family love chinese foods very much dunno whether coz we are living in Chinatown.If someone asks us wats your favourite cuisine my whole family will say chorusly chinese cuisine especially their seafoods,we love it very much. If we have family get together or any potluck party, i'll definitely make chinese dishes mostly chicken fried rice, even my friends will request me to bring some chinese foods than the South Indian foods whenever we plan for a party together. For me,chinese dishes are quite easier to make when compared to our Indian foods,obviously i'll make chinese dishes atleast once a week. Coming to this schzewan prawns, i want to make these droolworthy prawns since ever my better half asked me to make some at home. Somehow i kept this dish in my to do list since a long and finally this weekend i tried my hands in making this fantastic dish. It was a big hit at home, i prepared a quick red chilly paste for making this schzewan prawns.Store bought schzewan sauces are quite handy and definitely makes our life easier but somehow homemade sauces are best and very flavourful when compared to the store bought sauces.If you dont like prawns, you can replace prawns very well with any veggies or meats.Sending to Julie's Flavors of Cuisine-Chinese. Soak 3-4 red chilies in warm water for half an hour and then grind to a fine paste along with 2 cloves of garlic and half a teaspoon of cumin seeds. This paste can be stored very well in fridge. Make a batter with the egg white, corn flour, white pepper and salt. Heat oil in a pan and fry the prawns till they are golden brown. This should not take more than 2 minutes. Take out and drain the excess oil on an absorbent paper. Heat the oil, add in the ginger, garlic pieces, dry red chilies, and fry well. Next add in the onions,carrot pieces; red chili paste and ketchup,cook well for few minutes. Add in the soya sauce and some water,when it comes to a boil, add in the fried prawns and the spring onion greens and salt. Make a white sauce with one teaspoon of cornflour and water, add this to the gravy. Adding corn flour turns the gravy thick. Add in the vinegar and give a stir. Serve hot with the fried rice or noodles. 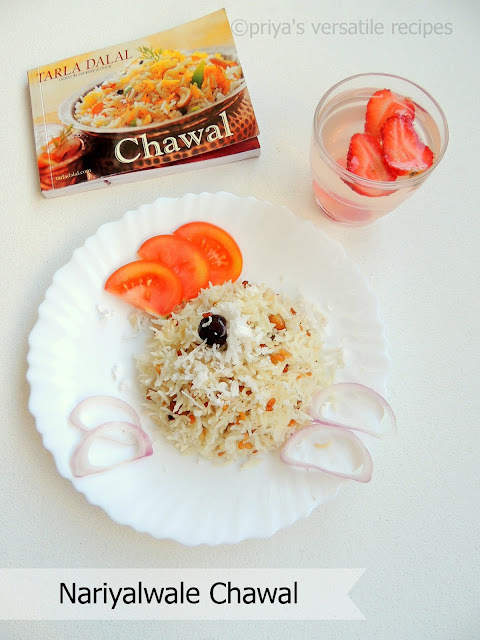 My second day of blogging marathon with coconut as main ingredient goes for a rice dish. I chosed this nariyalwale chawal from the famous Tarladalal's Chawal cookbook, as my theme of this week goes for chose an ingredient and cook from 3 different cookbooks.Initially i want to chose paneer as most of the cookbook have atleast three or four dishes with paneer as main ingredient, so i felt that paneer is quite an easy choice and i want to make my theme more interesting. Thats y i went through my cookbooks seriously for almost 4 days and finally i chosed coconut as main ingredients. Thanks to Srivalli for pulling me to go through my cookbooks as they were sleeping in my book shelf since a long. Coming to this coconut rice, this rice is completely different from the usual South Indian coconut rice, yep this rice is cooked in coconut milk and the tempering part goes for urad dal and moongdal with some peanuts and usual spices. South Indians make their coconut rice simply by making a tempering and add the freshly grated coconuts to the rice. This nariyalwale chawal is between our usual coconut rice and coconut pulao,however i prepared this dish three days back and serve with a spicy potato fry. Since this rice will be mildy spicy,its better to serve them with a spicy side dish.Check out the Blogging Marathon page for the other Blogging Marathoners doing BM#26. Wash and soak the rice for 15minutes,drain and keep aside. Heat oil in a pressure cooker, add the urad dal and moong dry and fry until they turns golden brown. Add the red chillies,curry leaves,crushed peanuts and fry again for few minutes. Now add the rice,saute for 2minutes, add the coconut milk,salt and pressure cook for 2whistles. Allow the steam tp escape, separate the grain of rice lightly with a fork. 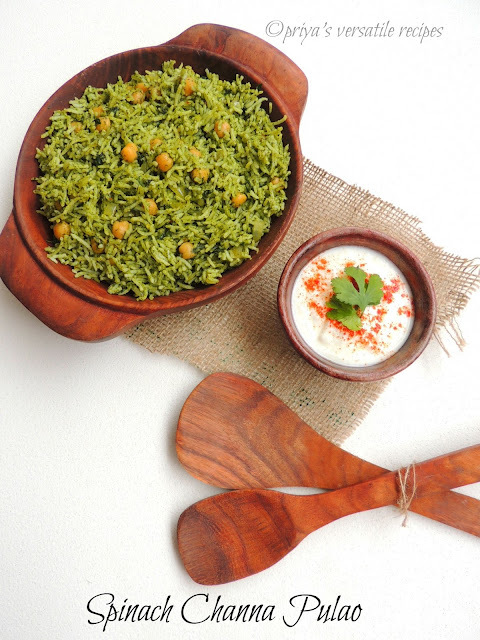 Serve hot garnished with grated coconut along with a spicy side dish. Am running my third week of blogging marathon from today onwards, and the theme of this week is Chose an ingredient and cook from different cookbooks. 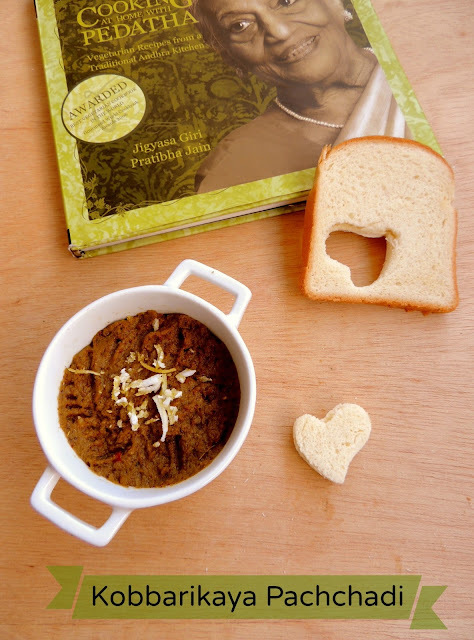 If you are living in abroad especially in European coutries,you dont have that much chance to get Indian cookbooks from our nearby libraries, the only way to get your cookbooks is either you have to order them through online or else ask your family from India to send them. But fortunately i have never bought my Indian cookbooks till now this way, in my previous post i have told that i have won a bunch of cookbooks through many food events in this blogsphere.Am quite happy with this decent number of cookbooks and i really want to cook from them, thats the reason i chosed this theme. This theme was quite tough and really challenging, thank god my cookbooks rescued me and i chosed 'coconut' as the main ingredient and cooked from three different cookbooks. For the first day i chosed a basic Andhra style coconut chutney aka kobbarikaya pachchadi from Cooking at Home with Pedatha. I prepared this brown chutney last week and this pachchadi will definitely tickle your tastebuds.Seriously i loved learning this chutney through this cookbook which is quite new for me.With a mild tanginess and spiciness, this chutney is a prefect pair for hot steaming idlies as well as for rice porridge. We just loved it..Check out the Blogging Marathon page for the other Blogging Marathoners doing BM#26. In a pan, heat enough oil and fry the urad dal from the 1st tempering until they turns golden, add the mustard seeds and fenugreek seed. Add the dry red chillies and fry until they turns brown, now add in the remaining ingredients and put of the stove. Grind this tempered spices with coconut,tamarind pulp,jaggery,salt into coarse paste, dont add water while grinding. Heat the remaining oil, add all the spices from the 2nd tempering and fry until they turns brown, add this tempered spices immediately to the pachachadi. Serve with any kind of dishes. Palak and tofu,both are my favourite and i love anything with these two. But since few months, my lil one started saying 'no' to tofu and he is completely refusing to take tofu.During my recent visit to nearby chinese store, i didnt hesitate a second to grab a packet of firm tofu and back home, i really want to add this wonderful soya cheese in our food. Everyone at home love parathas, so obviously i'll try to make parathas quite often with anything, if you go through my recipe index , you can definitely see how we love parathas, obviously i have a huge collection of different parathas. Finally i prepared this green parathas with spinach and tofu puree, i simply cooked some spinach leaves and finally i grinded both the cooked spinach and extra firm tofu together to make a thick puree. I used this puree for kneading my dough, so that none will notice the addition of tofu. The addition of tofu turned out this paratha simply super soft and these parathas while cooking puffed very much like our rotis.My kids simply loved this attractive green parathas and needless to say my lil one enjoyed very much.Now i know how to feed my small picky eater with tofu.Sending to my own event Healthy Diet-Go green guest hosted by Amurta. Bring boil a cup of water, add the cleaned and chopped spinach, cook for few minutes until they shrinks. Drain the excess of water and take the cooked spinach,tofu together in a mixer, grind as smooth paste without adding water. Keep aside for half an hour, make 7-8medium sized balls from the dough, dust it with enough flour and roll them as round circles. Heat a tawa, add the rolled parathas to the hot tawa, drizzles oil and cook in medium flame until both sides gets well cooked. Enjoy this healthy parathas with your favourite side dish. Every 15th of the month, if you are following my space my followers will definitely know that am a part of a group with a decent bunch of home bakers called baking partners.This challenge was started by Swathi of Zesty South Indian Kitchen and every month we will be baking cakes or breads. 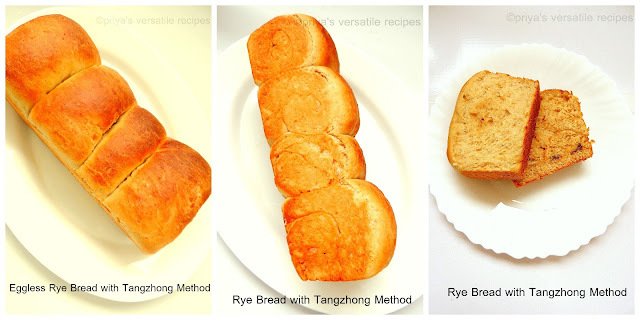 Our this month's challenge was bread with Tangzhong method and scalded method.I decided to bake my breads with tangzhong method, this method of baking bread is quite famous in Asian countries. Tangzhong is a water roux method prepared with a part of flour along with 5parts of water combination.This mixture is later cooked in low heat to make a roux, once this mixture thickens, its cooled down to room temperature and this roux is used in bread making. Leftover water roux, can be conserved very well in fridge in case if you need just half of the prepared roux for making a bread.Tangzhong method gives super softness to the bread and also keep the bread will stay fresh much longer than the usual breads.You can make the famous Indian dilkush/dilpasand, coconut and dry fruits stuffed bread with this tangzhong method. 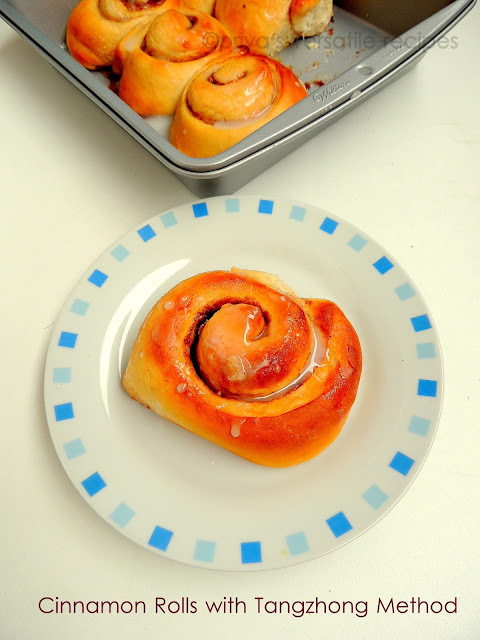 However i choosed to bake mine with rye flour as a simple bread and as cinnamon rolls with all purpose flour and wheat flour combination. Mix the flour in water well without any lumps. Take the flours,sugar,salt,milk powder and instant yeast in a bowl,make a well in the center. Meanwhile take the milk,mashed potatoes, tangzhong in an another bowl,whisk well and add it to the dry ingredients. Knead everything as a dough, add the butter and knead again for a while, this dough will be smooth but not sticky and elastic. To text stretch the dough, if its forms a thin membrane, your dough is done. Knead the dough as a ball and place it in a greased bowl,cover it and let it sit in warm place for about an hour. Transfer the dough a flate space, deflate the dough and divide into three or four equal parts, place it in a plate and let it sit again for half an hour covered with plastic. Roll the each balls as long oval and roll it to form a log like loaf.Place it in a greased loaf pan, keep again for an hour to double their volume. Brush the loaf with milk and bake for 25-30minutes until the crust turns golden brown. Remove the bread from the pan and cool it completely before slicing. I used few chocolate chips while rolling my loaf but unfortunately i didnt sprinkled them generously. I replaced the rye flour with wheat flour and prepared my bread dough with water roux. Slice the dough as thick slices,arrange those slices over a greased baking square pan..Cover it with a plastic wrap and let it sit again for an hour until they double their volume. Preheat the oven to 350F..arrange the baking pan in the middle rack and bake the uncooked rolls for 25-30minutes until its turn golden brown. Let them cool,prepare a thick paste with confectioner's sugar and water,drizzle over the rolls once they gets cool completely. For this month's Indian Cooking Challenge, Srivalli challenged us with a God's own country aka Kerala's plantain halwa. Initially i was waiting something savoury for this month's challenge. But finally am very happy to try my hands in making this delicious plantain halwa.Jayashree shared her mom's recipe of this pazham varatti. This halwa ressembles quite like a jam but tastewise they were very much like halwa. Since i dont get Kerala variety of plantains here, i got some overripen plantains from nearby African store, to try this halwa.Finally i got two plantains and prepared this halwa last weekend.Trust me, you guys should give a try to this halwa,they were fantabulous,super tasty. This halwa is my H's recent favourite, actually he is pestering me when am gonna make this halwa again. A big thanks to Valli and Jay for suggesting this wonderful halwa, we just loved it. Before making the halwa,peel two plantains and cut them as rounds, pressure cook it for 3hisses.Once the steam gets released,let it gets cool completely. Grind the cooked plantains as smooth paste. Measure this pulp to make a cup of plantain pulp.Now you can proceed to prepare this delicious halwa. Transfer the cooked plantain pulp to a heavy bottomed pan, add the sugar and cook everything in medium flame. Add the ghee little by little while cooking, once the mixture gets thickens and the halwa gets off from the vessel. Transfer the halwa to a bowl. Enjoy when they were still warm,we loved it when they were still warm. In case if you dont have plantains, you can prepare the same halwa with normal bananas. If you are using bananas,just peel and grind them directly in a mixer and prepare the halwa directly,no need to cook the bananas as we do for the plantains. Chose well ripen plantains for making this halwa, else your halwa wont get this dark brown colour. I love challenges, especially food challenges, they will definitely pull you to bring out our creativity and obviously your creative mind will dish out many fabulous dishes. Here comes my one creative bake aka cake with lemon tea and pistachio for our this month's Magic Mingle Challenge, when Kalyani announced this combo i never thought that my fellow bloggers who are all part of this challenge will bring out this much varieties foods with these combination. I can guess very much that even Kalyani might be astonished to see the foods they are dishing out. 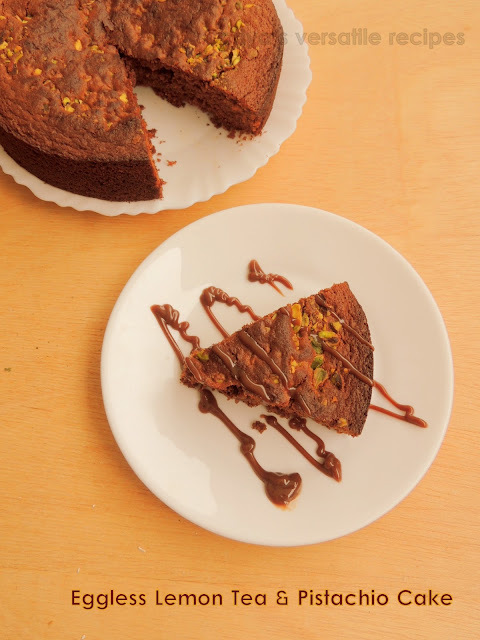 Coming to this chocolate cake, i quickly prepared this cake for our evening snacks when it was snowing here, lemon tea gives a wonderful aroma to this usual chocolate cake and needless to say about the nuttiness by pistachios in this cake. This cake takes very less time to get ready and they also get vanished very much easily if you have chocolate lovers at home. Recently while doing an another challenge, i came to know that we can add boiling water to the chocolate cake batter to make them soft and moist, i used the same techinic here and replaced the boiling water with boiling lemon tea. If you love citrus bakes, this cake is for you. Heat the oven to 350F, grease a round pan and keep aside. Stir together the sugar,flour,cocao powder,baking powder,baking soda,flax seed meal and salt in a bowl. Meanwhile take together the yoghurt,vegetabke oil an vanilla in an another bowl, make a well in the middle of the dry ingredients. Gradually add the wet ingredients,boiling lemon tea to the dry ingredients,mix it well. Fold in gently the chopped pistachios. Pour the batter to the prepared pan, sprinkle some nuts on the top and bake for 20-25minutes until a skewer inserted comes out clean. Cut the cake as you desire and serve with a chocolate sauce or dust the cake with confectioner's sugar. Sunday lunch is always my favourite, especially if its something healthy as one pot meal i wont say no. Most of our sunday lunch goes for briyanis, this weekend H was bit busy with some stuffs and he didnt stayed with us for the lunch. Obviously, if the man is not at home who will cook briyanis, i completely skipped briyani and went for an easy breezy green pulao with channa aka chickpeas.My kids loves chickpeas and palak, i know this pulao will be a big hit among them, am not wrong they just loved this healthy and flavourful pulao with papads,none at home complained eventhough i served this pulao just with papads,coz my kids cant imagine their sunday lunch without meats or atleast an egg. As i told earlier in most of my posts,i'll always soak the beans in large quantity,once they get soaked i'll pat dry them and immediately i'll freeze it for further use. My freezer will always have frozen soaked beans to cook anytime of the day. Many of my blogger buddies told me that they also started following this method now, yep this method is really handy and you just need to pressure cook your beans and add them in your rice dishes or in gravies, wat an easy method na.Coming to this pulao,you can carry this pulao very well in your lunch box and definitely an easy peasy pulao which gets ready in a jiffy.Sending to my own event Healthy Diet-Go green guest hosted by Amurta. Grind the spinach,green chillies together as fine paste. Heat a heavy bottomed pan, add enough oil, fry the bayleaves,shah jeera until they turns brown. Add immediately the chopped onions,ginger garlic paste and saute until the onions turns transculent and the raw smell of the ginger garlic paste goes away. Now add the already prepared spinach puree,garam masala powder to the cooking onions,cook everything in simmer for few minutes. Finally add the cooked chickpeas, cook for few more minutes. Add the already cooked rice to this palak-chickpeas mixture, toss everything gently until the rice gets well coated with the masala. Put off the stove, add the pepper powder, give a gentle toss again. Serve with your favourite side dish or raitas. I was searching something sweet also at the same time something healthy for our evening snacks few days back, while going through my fridge i saw a cup of channadal halwa and finally i prepared this excellent sweet parathas. 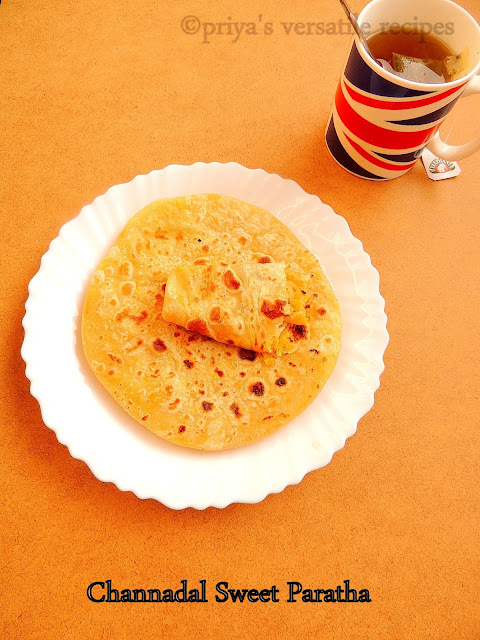 With a simple wheat chappathi dough, i prepared quickly this sweet paratha and this parathas tastes absolutely fabulous to enjoy with a mug of spiced black tea. These parathas turned out extremely light,filling also at the same time an excellent tea time snack, this sweet paratha may sounds exactly like our famous puran poli, but the dough usually we make puran polis goes for all purpose flour aka maida, i completely skipped maida here and went for whole wheat flour.Since i cooked this parathas in a non stick pan, these parathas are completely oil free, in case if you want to drizzle some oil, you can definitely go for it. Watever,we just loved this delicious channa dal halwa stuffed sweet parathas for our evening snacks and we just loved it.Sending to my own event Cooking with Seeds-Dals. 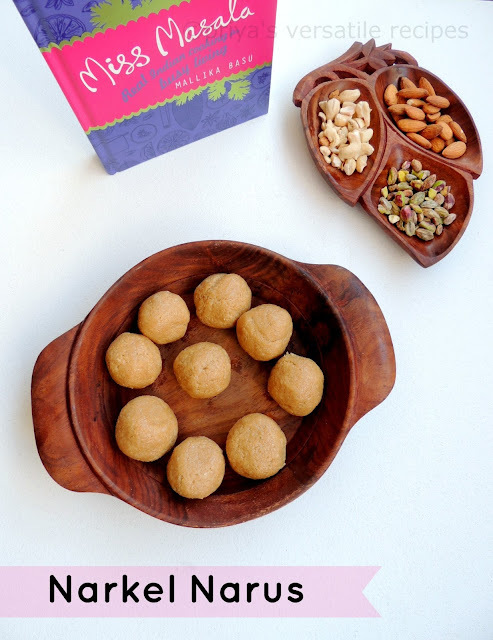 Make 6-7small balls from the channa dal halwa and keep aside. Flatten the wheat balls as medium sized circles,place the small ball of channadal halwa inside the circle and close the edges of the dough completely. Dough with some flour and roll it gentlu as medium sized parathas.